Perry's Chemical Engineers' Handbook has equipped generations of engineers and chemists with an expert source of chemical engineering information and data. It includes comprehensive tables and charts for unit conversion. A greatly expanded section on physical and chemical data. The latest advances in distillation, liquid-liquid extraction, reactor modeling, biological processes, biochemical and membrane separation processes, and chemical plant safety practices with accident case histories.The Eighth Edition of this classic guide provides unsurpassed coverage of every aspect of chemical engineering-from fundamental principles to chemical processes and equipment to new computer applications. 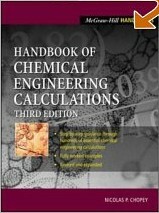 This handbook Provides detailed procedures for performing hundreds of chemical engineering calculations along with fully worked-out examples. Provides detailed procedures for performing hundreds of chemical engineering calculations along with fully worked-out examples. Fully revised and expanded, this Edition delivers step by step procedures for performing a wide array of chemical engineering calculations along with fully worked out examples that help you avoid costly errors. An indispensable tool for chemical engineers, this handbook will minimize your effort and maximize you output. The Handbook for the Chemical Analysis of Plastic and Polymer Additives provides a detailed reference for the analysis of additives that are most widely used in plastics and polymers. The handbook offers a unique combination of comprehensive chromatograms, mass spectral data, and analytical data in addition to environmental perspectives and regulations issued by the FDA, USEPA, EU agencies, and other groups. This makes it an ideal reference for monitoring plastics for regulatory or internal compliance applications as well as for using analysis to troubleshoot, develop, or improve upon application-specific compounding practices and processes. The definitive reference of laboratory safety, analytic procedures, and instrumentation techniques for the modern chemical laboratory.This handbook contains expanded chapters on gas chromatography (GC) and high- performance liquid chromatography (HPLC) and physical properties and testing methods, with a new chapter on thermal analytic methods as well as on electrophoresis. Also includes up- to-date information on the role of chemical laboratory technicians and chemical process operators in industry and current data on laboratory safety, chemical waste disposal, government regulations, and ISO-9000. Explains in detail the day-to-day procedures, techniques, and formulas of today's chemical laboratory. The Handbook of Basic Tables for Chemical Analysis, Second Edition is a source for the information needed to design chemical analyses. An expanded section on gas chromatography that includes data on compounds that attack common detectors. New information on detector optimization. An updated section on high performance liquid chromatography that provides the most recent chiral stationary phases, detector information, and revised solvent tables. Updated information on the most useful wet chemistry methods. Enlarged section of Miscellaneous Tables Going far beyond the landmark first edition in terms of scope and applications, it provides current and updated data culled from a wide range of resources and consolidated into a concise yet easy-to-use format. The Handbook of Chemical Process Equipment is a major reference on process equipment. It provides practical understanding and description of the working principles, intended applications, selection criteria and fundamental design principles for equipment used throughout the process and allied chemical industries. A practical reference for chemical process equipment. Can be used throughout the process and allied chemical industries. Unit operations and equipment described in detail. 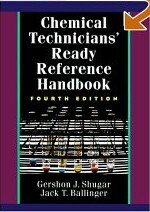 A major reference work on process equipment. Provides practical understanding and descriptions of the working principles, intended applications, selection criteria, and fundamental design principles for equipment used throughout the process and allied chemical industries. The handbook has marshalled an impressive amount of information on the selected process sectors, presented in a clear and concise manner, with the discussion on production technologies supported by a lucid explanation of the underlying chemistry and reaction routes. For environmental consultants and those engaged as expert witnesses on industrially related pollution problems, the information in this book will prove invaluable. A valuable handbook providing user friendly access to details of the environmental impact of industrial chemical processes. Handbook of Chemical Vapor Deposition, Second Edition: Principles, Technologies and Applications, reviews in depth the recent expansion of the number of materials produced by CVD; copper, tungsten, diamond, silicon carbide, silicon nitride, titanium nitride and others. DLC: Chemical vapor deposition. Practical approach in the handbook stresses CVD use in industry, such as semiconductors, optoelectronics, optics, cutting tools, refractory fibers, filters, and man others. Coverage of the chemistry and deposition techniques of new materials produced by CVD as been greatly expanded in the book. Emphasizes the broad expansion of the use of CVD processes in todays industry, showing the reasons for the growth and the different applications. The most comprehensive reference available on this topic, Fluid Flow Handbook skillfully blends theoretical review and engineering practicality. Discussion of issues critical to civil engineers, including flow in open channel, flow meters in rivers, and discharge from hydraulic structures. Integration between physical properties, thermodynamics and heat transfer into fluid flow analysis. Numerous applications from petroleum distribution, piping flow, valves, and other fittings. Equations, charts, tables, solution steps, and computer programs to facilitate step-by-step calculation and much more. Written by more than 40 world renowned authorities in the field, this reference presents information on plant design, significant chemical reactions, and processing operations in industrial use - offering shortcut calculation methods wherever possible. This book becomes more complete with many and latest information about petrochemical technology. It becomes interesting by giving description about producing of chlormethanes from oxychlorination of methane. Containing convenient sections on conversion to and from SI units and cost indexes for quick updating of all cost information, it is an essential resource for process, process design and project engineers; industrial chemists; and continuing education students. 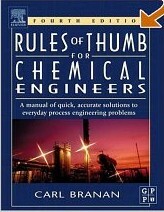 Rules of Thumb for Chemical Engineers - under one cover are practical tips, handy formulas, correlations, curves, charts, tables, and shortcut methods that will save engineers valuable time and effort. this book is a handy reference tool for preliminary designs, and has some very useful information on several aspects of plant operation. This book provides a huge amount of valuable information on a wide variety of chemical engineering applications from sizing pipelines to economic evaluation of process options. Handbook of Solvents - Intended to provide readers with a better understanding of solvent selection and use, at all levels of the industrial process, from the formulator to the safety coordinator. Provides background and fully explains concepts. The Handbook of Solvents contains information about the usages of solvent. This book can guide to select solvent by its solubility properties, evaporation properties, toxicities and their relation to the appropriate applications. Explains solvent formulation principles in 33 major industries from adhesives and aerospace to stone, clay, glass, concrete, and wood products. Comprehensive coverage of international health, safety, and environmental technologies. Includes the newest water-based, green technologies. 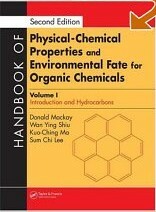 Handbook of Physical-Chemical Properties and Environmental Fate for Organic Chemicals is a comprehensive series in four volumes. 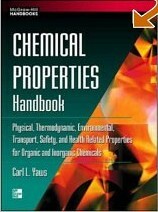 This handbook is a compilation of relevant data on physical-chemical properties of organic chemical substances, that are used for understanding or modeling their environmental fate as they are transported and transformed in the multimedia environment of air, water, soils, sediments, and their resident biota. These fate processes determine the exposure experienced by humans and other organisms, and ultimately the risk of adverse effects. this handbook contains compilations of physical-chemical property data for about 1250 compounds. This easy-to-read source provides a wealth of stimulating information on the design of inherently safer and user-friendly plants. It demonstrates how plants can withstand human error and equipment failure without serious effects on safety, output, or efficiency. Examples of user-friendly design and increased coverage on design procedures are implemented. Provides information on the design of inherently safer & user-friendly plants, demonstrating how chemical plants can withstand human error & equipment failures without serious effects on safety, output, or efficiency. 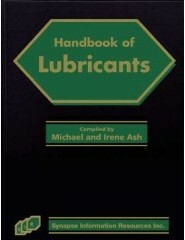 Describes more than 8500 chemicals and materials that function as the major component in lubricant formulations. This reference will serve as a comprehensive source of information on currently available solid, synthetic, grease, wax, and oil lubricating substances including both trade names and generics. Lubricants are essential ingredients for diverse application areas including: air conditioning and refrigeration, cosmetics, electronics, foods & beverages/food processing, fuels, heat transfer fluids, metalworking, paints/coatings, pharmaceuticals, plastic and rubber processing. Forensic chemist Steven L. Hoenig has compiled information from diverse sources to produce this ready reference with details on various chemicals, including identification tips, symptoms and treatment procedures, protective gear necessary to counter each threat, and a step-by-step description of decontamination procedures. A brief overview of the history of chemicals used in warfare is followed by a discussion of the different categories of chemical threats. This guide includes clear diagrams and explanations, and has been compiled with both the layman and professional in mind, making it a useful addition to any military, medical, or home library. Crystallization is an important separation and purification process used in industries ranging from bulk commodity chemicals to specialty chemicals and pharmaceuticals. In recent years, a number of environmental applications have also come to rely on crystallization in waste treatment and recycling processes. Provides an ideal introduction for industrial crystallization newcomers Serves as a worthwhile reference to anyone involved in the field Covers all aspects of industrial crystallization in a single, complete volume. 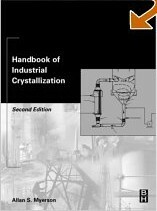 Complete volume covering all aspects of industrial crystallization, including material related to both fundamentals and applications. Serves as a reference to anyone involved in the field. The Comprehensive Handbook of Chemical Bond Energies compiles the most recent experimental BDE data for more than 19,600 bonds of 102 elements. The author organizes the data by bond type, functional group, bond order, bond degree, molecular size, and structure for ease of use. Data can also be located using the Periodic table. The book presents data for organic molecules, biochemicals, and radicals as well as clusters, ions, hydrogen- and surface-bonded species, van der Waals complexes, isotopic species, and halogen-clusters/complexes. It also introduces entirely new data for inorganics and organometallics. Chemical Bond Energies offers quick access to experimental BDE data in the most inclusive, well-organized, and up-to-date collection available today. This book describes the application of methods for determining the instability and incompatibility of petroleum products. An increasing variety of petroleum feedstocks has produced an ever diversifying array of petroleum products. Consequently, new analytical techniques are constantly being developed in order to determine the appropriate applications for these new products. The Handbook of Petroleum Product Analysis provides detailed explanations of the necessary standard tests and procedures that are applicable to these products in order to determine the predictability of their behavior. Chapters includes - Naphtha, Aviation Fuel, Kerosene, Distillate Fuel Oil and Asphalt.